(October 25th, 2018) The 50th anniversary of WKBW radio’s War of the Worlds, the most famous radio broadcast in Buffalo’s history, will be celebrated with the screening of a new documentary film and a re-airing on Halloween night along with two other unique and famous versions of HG Wells Martian invasion story. 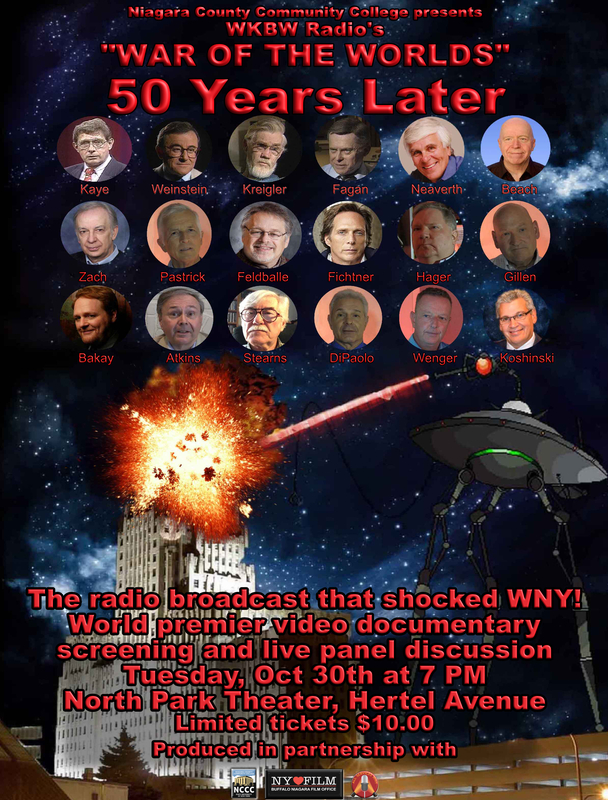 The documentary film entitled “WKBW Radio’s War of the Worlds, 50 Years Later” will be screened on Tuesday, October 30th at 7 PM at the North Park Theatre, followed by a live panel discussion. The film, produced by All Services WNY and sponsored by the Buffalo/Niagara Film Office and Niagara County Community College features interviews with the late Jeff Kaye, Irv Weinstein, Jim Fagan and other members of the original cast of KB radio’s War of the Worlds. Also, in the film are iconic radio legends Sandy Beach, Dan Neaverth, Dan Kriegler, John Zach, Pat Feldballe, Jim Pastrick, Tom Atkins and John Hager. Film and television actor William Fichtner and television and film producer Nick Bakay, who both grew up in Buffalo, share their memories of the Buffalo Halloween broadcast along with Buffalo Broadcasters Chairmen Emeritus Dave Gillen, Entercom Operations Manager Tim Wenger, 97 Rock Promotions Director Dave Jickster and famous Blasdell restaurateur Dennis DiPaolo. “The Buffalo/Niagara Film Office has been very supportive of artists coming to our region to create magic on the screen,” said Film Commissioner Tim Clark. “What Jeff Kaye and the tremendously talented people at WKBW radio did fifty years ago is no less inspiring and we are proud to be a part of celebrating their masterpiece, “added Clark. “Niagara County Community College is excited to be part of this historic event. We feel our students, faculty, and alumni will be fascinated and intrigued to hear the sensational story of what happened fifty years ago during Buffalo’s War of the Worlds radio broadcast,” said Niagara County Community College Public Relations Director Barbara DeSimone. Then on Halloween night, in keeping with the 50th anniversary celebration, Entercom radio will twice re-air the original 1968 version of War of the Worlds on WWKB, 1520 AM beginning at 6:00 PM. WECK radio will then air the original Orson Welles 1938 version at 9 PM, proceeded by a two-hour special Halloween edition of “WECK After Hours” hosted by Moon Rivers. “WECK radio surrounds ourselves everyday with legendary personality radio. It’s the reason we exist. We couldn’t be prouder to air the original version of this world changing broadcast of War of the Worlds. It’s quite simply pure vintage real radio,” said WECK owner Buddy Shula. A limited number of tickets for “WKBW Radio’s War of the Worlds, 50 Years Later” are $10.00 and available at https://www.northparktheatre.org/shows/700-pm-wkbw-radios-war-worlds-50-years-later/.